My grandfather on my mom’s side of the family died when I was in elementary school, and shortly after that his brother, my great uncle Arthur, made a reappearance in our lives. My mom took her father’s death hard, which she showed in the usual manner: by accounting for all of the ways Bob (even us grandchildren called my grandfather Bob) was a pain, and all of the ways he wasn’t; by repeatedly thumbing through family photo albums and keepsakes; and with at least one reported ghost sighting, in a hotel room late one night while she was at an academic conference in Kentucky. But the main form grief took was storytelling; my mom and aunts recounted Bob’s short temper, his artistic skill, and his biting wit. Maybe it is for this reason that Bob’s death also marked the reappearance of Arthur in our lives: there would be no new stories with Bob, but we could still discover old, unknown ones. Arthur’s life was distant and glamorous to us Knapp children. He lived in Paris and had a job as a reporter for the International Herald Tribune. He’d spent his career traversing the globe to cover world events, and though his job probably consisted of a lot of drudgery, filing copy and that sort of thing, I had this image of him when I was younger as journalism’s answer to James Bond: part swagger, part wit, and he liked his drink a specific way. (Shortly after Arthur quit drinking at his doctor’s advice, he showed up at our house with a pack of nonalcoholic beer; he took his with a “just a splash” of vodka.) Part of what made his stories so great was that he could relay world events not because he read about them but because he had reported on them. For this reason, we forgave his occasional grumpiness; he was a stickler about grammar, and if you dared pronounce the “T” in “often,” he would snap and say it’s a secondary pronunciation for a reason. Our favorite of his stories was not about his many travels, though, but instead an anecdote about him, my late grandfather Bob, and a cake. When Arthur and Bob were young, their parents (my great grandparents) threw a party for a neighbor’s birthday, for which they baked a beautiful chocolate cake, with waves of frosting on all sides and a ring of truffles that went around the top. It gave the whole house a velvety smell that drove Arthur and Bob up a wall, the kind of temptation that makes a kid take a little nibble of something forbidden, “just to see,” and to hear it told, it was only my great grandmother, apparently a very stern woman, who stopped this from happening. “You can try some if there’s any left after the party,” she promised them, and that was that: they were confined to their bedroom while the adults drank their gin and tonics and smoked cigarettes with the windows closed—it was a different time. The party eventually ended, their parents went upstairs to pass out, and not a second later Arthur and Bob were in the kitchen; it was past midnight at this point. By some miracle, there were exactly two slices of cake leftover. They couldn’t believe their luck; they had spent the entire night thinking about this cake, lamenting over the injustice that they might not get any, and here it was. There was just one problem: one of the slices was much bigger than the other, and Arthur and Bob were both eying it. “Thanks,” Bob said putting the bigger slice on his plate without hesitation. “Are you serious?” Arthur said. “What? Which would you’ve taken?” Bob asked. This was just one of the stories Arthur told us time and again, and we never tired of hearing it; it seems Arthur still hasn’t tired of telling it—he is in his nineties now, but again on his most recent visit he retold it to us. Whether or not the details are all true—and they can’t have been, because they’ve changed over the years—the story held a power over us. For my mother, it brought her father and all of his mischievousness back to the table for an encore performance. The Nobel Prize-winning author and playwright Doris Lessing wrote, “There is no doubt fiction makes a better job of the truth.” In her autobiography Brown Girl Dreaming, Jacqueline Woodson wonders, “How can I explain to anyone that stories/ are like air to me,/ I breathe them in and let them out/ over and over again.” But what makes stories so essential? What makes them not just entertainment but sustenance, or as Philip Pullman put it, why is it that “after nourishment, shelter and companionship, stories are the thing we need most in the world”? The demand for narrative from language is nothing new. The Epic of Gilgamesh, one of the earliest surviving examples of great literature, dates back about 4,000 some-odd years. In it, a man Enkidu is sent by the gods to humble the prideful king Gilgamesh and a battle ensues, with neither coming out victorious. Instead, the two become something of unlikely friends—until Enkidu dies, sending Gilgamesh into the despair of grief and on a journey in search of eternal life. No doubt, at some point or another, you’ve picked up a book in a store that was described as an “unforgettable story about the redemptive power of friendship.” Well, unforgettable maybe, but I think The Epic of Gilgamesh shows that it was not the first. Like my great uncle telling us repeatedly about the two pieces of cake, we all return to the same stories again and again—they might be updated or reworked, reframed and re-imagined, but deep down they share roots. That is because what makes stories so compelling, the reason we crave them, is not for the accounting of events or for the answers they provide, but instead for the questions they ask; as Brandon Sanderson once put it, “The purpose of a storyteller is not to tell you how to think, but to give you questions to think upon.” Since the beginning of time, long before Enkidu and Gilgamesh became buddies, we’ve been probing at this thing called life and trying to insist some sense out of it. At their core, then, stories aren’t theses but questions. They are essential because they are the prompts for our own journeys. My journey in publishing began in 2009, after graduating from college, and for as long as I’ve been in the business—admittedly, I hope these are still the relatively early days of my career—there’s been a quiet but consistent anxiety about the so-called “state of publishing.” There have been countless articles in the Times and Publishers Weekly, and there have been conversations had at book fairs—I feel like every year, I read an article about the “optimistic energy” at the Bologna Book Fair as though we’re typically such a downtrodden group of pessimists in the kid lit world—and all of these conversations center on the way forward for our business. There’s reason for the nervousness: with the rise of ebooks, Amazon and self-publishing and increasing competition for time with digital media, there’s a lot of newness and uncertainty. But if there’s one thing that books have taught us, it’s that uncertainty makes for a great story. I don’t know what publishing will look like in the years and decades ahead, but I know this: good stories will always be in demand. That’s because storytelling is wired into us—quite literally, actually. When we’re reading facts—for example, this one—the part of our brain that processes information flares up with activity. But when we’re processing stories, various parts of our brains ignite: so, in the story about chocolate cake, if I did my job, the parts of your mind that deal with smell and taste and excitement and so on and so forth would have had spikes in brain activity. This phenomenon of so-called “mirror neurons,” described in Jonathan Gottschall’s book The Storytelling Animal, has been well-documented since its discovery in the 1990’s, when researchers found that a specific area of monkeys’ brains lit-up not only when they grabbed a nut, but also when they watched another monkey or person grab a nut. In other words, your brain doesn’t process a story so much as it experiences it—as though you’ve lived through it yourself, at least to some degree. This shouldn’t be too surprising. When I was about three-years-old, and my brother Mike was maybe four, my mom put on The Land Before Time and left the room, thinking it was an innocuous movie about dinosaurs on a fun-spirited adventure. But by the end of the first act, there was social conflict between different groups of dinosaurs, the world was suffering from catastrophic climate change, and Littlefoot’s mother dies in what in my mind remains one of the more heartbreaking scenes of cinema. (Littlefoot, walking through the rain and discovering his dying mother, whispering: “Mother? Please get up.”) My brother and I lost it—so much so that for days after we kept breaking down into tears, distraught by Littlefoot’s loss. We put ourselves through this rollercoaster of emotions every time we step into a story. Think about how irrational it is for us to willingly subject ourselves to this. In The Fault in Our Stars, Hazel, a teenager with cancer who has already outlived her prognosis falls in love with a boy whose cancer is in remission. Sabaa Tahir’s An Ember in the Ashes opens with the brutal murder of Laia’s grandparents and imprisonment of her brother, and things don’t get easier for her from there. The agent Donald Maas has a saying about how to improve the plotting of a story—he says, “Make it worse!”—meaning, if we want to improve the story for our readers, we have to make it harder on our characters. But if when we engage in stories our brains react as though we might be experiencing events ourselves, then why in the world do we subject ourselves to narratives where we know that the resolution is unlikely to be a happy ending? Why not read stories about lying around on a warm, breezy beach while drinking piña coladas? When Hazel and Augustus are falling in love, we feel a protective instinct: this can’t end well. Hearts will be broken. We know this. Yet, not only do we read on—we don’t heed our own warning. We let ourselves fall in love with these characters as well, not knowing if in the end they’ll be okay. If you had asked my brother Mike and me when we were younger what our favorite movie was, we might’ve told you The Land Before Time. Yes, it broke our hearts a little, but we also laughed at Spike’s antics and fell in love with the adorable Petrie; we screamed with terror when the Sharptooth attacked, and held our breath when Cera accidentally leads Ducky and Spike into the path of molten lava. We loved the movie not despite Littlefoot losing his mother, but because of it; it gives the movie one of its driving questions, which Littlefoot asks as his mom assures him she’ll be with him no matter what, even if she can’t see him. “What do you mean if I can’t see you?” Littlefoot asks. “I can always see you.” When Littlefoot follows the cloud that looks like his mom to the Great Valley at the end, we lost it again—but this time, we knew we’d be okay. I’ve heard many people say that stories help us make sense out of the random events that make up life—that they bring order to chaos. This is true, I think, but not the full truth. A story’s job isn’t to necessarily bring structure to chaos but to prepare us for the chaos itself. They train us to take chances, to continue on in the face of uncertainty, and to call up all of our courage when we need it most so that we can soldier on through all of the things life might throw our way. Our impulse to weave narratives starts at a remarkably young age. Take a moment to think to some of your earliest memories. My own earliest memories are from the age of two or three, when my family lived in Maryland. We’d moved down there from Connecticut and only stayed for about a year, but it served as the starting point for one of the most important friendships in my life. Next door to us were the Truslows, and I became instant pals with the youngest of their clan, Emily, who was my age. I scandalized the neighborhood regularly by waking up bright and early, escaping my room and making haste to the Truslow’s place, often buck-naked. For me, play couldn’t wait. My memories of playing at the Truslow’s are like an old dream—I have only a few images in my mind: the muddy path between our yards; the high wooden fence that enclosed their back garden; the Truslow’s screened-in porch. That porch is where Emily’s Fischer Price play kitchen was, and I was obsessed with it. There’s a reason I always rushed over there so early, and without taking the time to dress: someone had to get a start on breakfast. Emily and I had some of our best times on that back porch, playing with that kitchen set. We also had some of our worst: our games were full of conflict—backstabbing and death and arrests—and my parents have reminded me that more than once I came home in tears (and I’m sure just as often, I was sent home after making Emily cry). Most mornings, though, it was just Emily’s mom Helen who would send me to put on a pair of overalls and get some real food in my stomach. Regardless, I always came back. Our games always resumed. By the time we are eight or so, most of us outgrow playing pretend in the childhood sense—I’ll admit, it took me a little longer, but I did eventually stop hauling around my stuffed polar bear like I was Calvin and he was Hobbes. Yet our demand for fictional narratives never ceases, and why should it? The truth we all know is that we never stop growing up—life is not a trip to a beach house. We never arrive and get to put our feet up. Instead, life just keeps happening, and so we need to continue rehearsing, to continue exercising our emotional intelligence so that when we are not watching a monkey pick up a nut but are instead picking up the nut ourselves, we know what to do with it. At the age of three, the Truslow’s back porch was the stage on which I could start rehearsing for adulthood. At twenty-nine, books are my best bet. As an agent, I am frequently asked what my taste in books is: what do I want to find in my inbox? I always struggle to answer with anything concrete. If someone wants to know: is dystopian saturated? Are vampire stories back yet? Well, these are questions I can try to answer; it is my job to keep a finger on the market’s pulse. If they want to know whether I like Tana French—I do—or Nova Ren Suma—I most definitely do—then I can tell them. But when it comes to not who but what gets my own heartbeat going, stories-wise, things become a little more nebulous, because I don’t go into books searching for specific plot points or archetypes—I go into them because I want to experience them. I want the swell of emotion that stories can create. People who don’t know any better sometimes describe kids books as escapist, but how wrong they are. When I read a novel, I am doing it for the exact opposite reason: I want to be armed with the uncomfortable feelings that let me face life head on. Books have, if anything, taught me how to be more mindful, more present. For all their complexity, perhaps the greatest power of books is quite simple: they make you think. In her speech at BEA’s 2012 Children’s Book and Author Breakfast, Lois Lowry said of writers: “That’s what we do, those of us who write: we wrestle with those questions that we can’t answer.” Perhaps this is the job of the author, then: not to show the way to an answer but to help the reader make peace with the questions themselves. It’s no small achievement. Writing is hard; I’ve learned this. If stories are meant to show struggle, drafting should serve as great inspiration. And I will confess to you, while I had months to write the original draft of this talk, I didn’t actually start drafting it until less than a week before it was due. Or, put another way: my apartment is never cleaner than when I have to write something. Writing demands a lot in terms of not only mental focus and creative energy, but also in terms of self-reflection. When we write, we are expressing a point of view, and refining and articulating a point of view is a difficult thing to do. Your efforts are worth it. Remember your own childhood? You are here because you survived it. I’m going to wager that books provided at least some of the courage required to make that possible, and if stories have prepared you for life, then life has been preparing you to tell stories all along, ever since you were a little kid playing on a neighbor’s back porch at 5:30 in the morning, cooking eggs where there was no flame. Barbara Kingsolver wrote, “Good fiction creates empathy. A novel takes you somewhere and asks you to look through the eyes of another person, to live another life.” How right she is, but I will add to this that in doing so, fiction doesn’t just reveal others to us—it reveals to us our own selves and helps us figure out how we might fit into the world. In her great speech at the 2012 Human Rights Campaign’s annual gala dinner, the filmmaker Lana Wachowski speaks about the difference between public and private identity that we are all forced to navigate. She describes the difficulties she faced growing up transgendered: “…without examples, without models, I began to believe voices in my head—that I was a freak, that I am broken, that there is something wrong with me, that I will never be lovable.” It was only a chance encounter that saved her from a suicide attempt. I had a happy childhood, but still growing up, whenever we started a book in English class and there was a male character, I always looked for the hints that he was gay; that I might find a book about a person who felt like I felt. The title of this talk is “Are We There Yet?”, a nod to John Donovan’s 1969 novel I’ll Get There. It Better Be Worth the Trip, often credited as the first young adult novel to feature any gay or lesbian content. I will tell you, we still have a long way to go when it comes to diversity—all diversity, not just in terms of gender identity or sexual orientation, but also race, religion, neurodiversity, physical disability, and everything else. If you are hearing a lot, recently, about the need for more diverse fiction—about the need for stories that reflect all readers, and not just some readers—it is not because it is some trend, but because it is truly a necessity: our inner lives feed on stories, and when we don’t find ourselves in those stories—and in the people who tell them—it is easy to lose ourselves. To feel erased. The need for readers to see themselves in fiction is very real. For some, it can even be a matter of life and death. For those of us on the business side of kid lit, it means there is a lot of work to be done. Stories can be powerful, but as a Spiderman comic put it, “With great power there must also come great responsibility.” As you come up against those tougher moments when writing—the points of worry and self-doubt—remember that you are doing important work. Of course it’s going to be hard, and I for one cannot thank you enough for taking the task on your shoulders. Every time you write a book, you provide us readers the chance to reflect, to evaluate, to understand the world and ourselves just a little more. And in doing so, you arm us with the language that lets us navigate that negotiation between our private and public lives—or, as the case may sometimes be, between two pieces of cake. Note: This essay was adapted from a talk Peter gave at SCBWI Austin’s May 2016 conference. 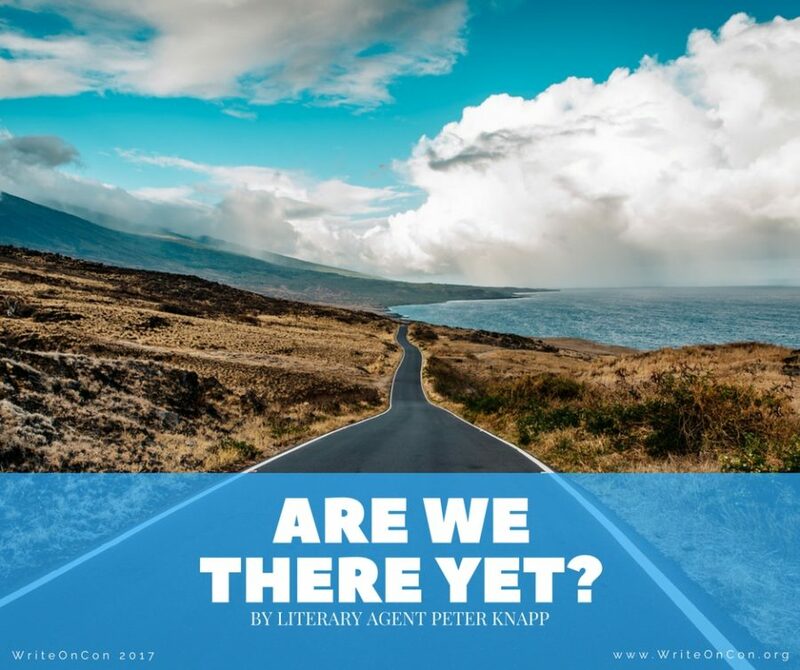 Peter Knapp is an agent at Park Literary & Media. Fueled by the thrill of reading a new story for the first time, Peter works creatively with his clients and the PLM team on marketing, branding initiatives and promotions to get great books into the hands of readers. Before joining PLM, he was a story editor at a book-scouting agency working with film & TV entities, and he continues to look for new ways to partner with Hollywood on adaptations and multimedia properties. Find him re-watching Studio Ghibli movies, playing board games with friends, or at www.parkliterary.com to submit a new fiction query — he’s ready to add more authors to his client list! Thank you for this! Your article was a fantastic way to end a fantastic conference! Yay WriteOnCon! This is beautifully written and very inspiring. Thank you! Thanks for such a lovely reminder of why we write–how very important it is! And now back to it!